Living in Charlottesville, Virginia and a USA Cycling Level 3 coach and has been a competitive road, MTB and CX racer for over 20 years. My athletes benefit from my enthusiasm, knowledge, and extensive experience training for and competing in multiple cycling disciplines. I enjoy working with all levels and ages of cyclists, including juniors, beginners, masters and elites. Strong communication skills and a personalized approach make each of my athletes feel supported as well as guided. Justin is currently enjoying his second go-around as a competitive cyclist. 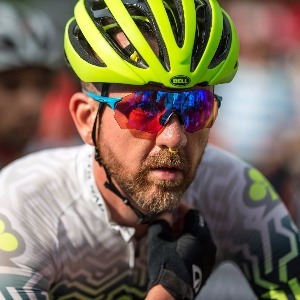 He started as an elite junior cyclist and triathlete in the Midwest and progressed to competing as a semi-pro mountain biker before “retiring” to start a family. After several years completely off the bike, Justin found himself completely out of shape and very overweight. Encouraged by his daughter who was beginning junior high track, Justin started running and cycling again. A return to more disciplined eating and training brought him back into competitive shape and also allows him to relate to athletes facing similar challenges, whether a rider is heavy or lean; starting out for the first time or looking to start over again while balancing family, work, and sport. Success. Coach Justin Bowes has been notified of your message.